W.C. Weinberg, S.H. Yuspa, A.A. Dlugosz, A.B. Glick, and T. Tennenbaum, Isolation and Utilization of Epidermal Keratinocytes for Oncogene Research. J. Ray, H.K. Raymon, and F.H. Gage, Generation and Culturing of Precursor Cells and Neuroblasts from Embryonic and Adult Central Nervous System. H. Land, Transformation of Primary Rat Embryo Cells. H. Beug, P. Steinlein, P. Bartunek, and M.J. Hayman, Avian Hematopoietic Cell Culture: In Vitro Model Systems to Study Oncogenic Transformation of Hematopoietic Cells. P. Crisanti, B. Pessac, and G. Calothy, Avian Neuroretina Cells in Oncogene Studies. D. Boettiger and C. DiLullo, Myogenic and Chondrogenic Cells. W. Krek and J.A. DeCaprio, Cell Synchronication. T.D. Tlsty, A. Briot, and B. Poulose, Analysis of Cell Cycle Checkpoint Status in Mammalian Cells. A.M. Killary and R.E.K. Fournier, Microcell Fusion. T. Yamamoto and Y. Kadowaki, Superfamilies of Protooncogenes: Homology Cloning and Characterization of Related Members. M.A. Sells and J. Chernoff, PCR Cloning of Related Genes. T. Miki and S.A. Aaronson, Isolation of Oncogenes by Expression cDNA Cloning. J. Samarut, F. Flamant, and J.-M. Heard, Replication-Competent and -Defective Retrovirus Vectors for Oncogenic Studies. E.M. Blackwood and R.N. Eisenman, Identification of Protein-Protein Interactions by lambdagt11Expression Cloning. P.L. Bartel and S. Fields, Analyzing Protein-Protein Interactions Using Two-Hybrid System. G.G. Hicks, E.-g. Shi, J. Chen, M. Roshon, D. Williamson, C. Scherer, and H.E. Ruley, Retrovirus Gene Traps. M. Perucho, J.Welsh, M.A. Peinado, Y. Ionov, and M. McClelland, Fingerprinting of DNA and RNA by Arbitrarily Primed PCR: Applications in Cancer Research. N. Lisitsyn and M. Wigler, Representational Difference Analysis in Detection of Genetic Lesions in Cancer. P. Liang, D. Bauer, L. Averboukh, P. Warthoe, M. Rohrwild, M. Strauss, and A.B. Pardee, Analysis of Altered Gene Expression by Differential Display. S.A. Schichman and C.M. Croce, Approaches to the Identification and Molecular Cloning of Chromosome Breakpoints. P. Lichter, M. Bentz, and S. Joos, Detection of Chromosomal Aberrations by Means of Molecular Cytogenetics: Painting of Chromosomes and Chromosomal Subregions and Comparative Genomic Hybridization. C. Robinson-Benion and J.T. Holt, Antisense Techniques. M.A. Labow, Use of lac Activator Proteins for Regulated Expression of Oncogenes. C. Cepko, E.F. Ryder, C.P. Austin, C. Walsh, and D.M. Fekete, Lineage Analysis Using Retrovirus Vectors. L. Tessarollo and L.F. Parada, In Situ Hybridization. J.-H. Chang, W.M. Sutherland, and S.J. Parsons, Monoclonal Antibodies to Oncoproteins. K. Kovary, Microinjection of Antibodies. W.T. Matten and G.F. Vande Woude, Microinjection into Xenopus Oocytes. A.K. Walker and P.J. Enrietto, Regulatable Chimeric Oncogenes. E.R. Eldredge, P.J. Chiao, and K.P. Lu, Use of the Tetracycline Operator System to Regulate Oncogene Expression in Mammalian Cells. L.J. Ransome, Detection of Protein-Protein Interactions by Coimmunoprecipitation and Dimerization. Y. Shiio, M. Itoh, and J.-i. Inoue, Epitope Tagging. G. Gish, L. Larose, R. Shen, and T. Pawson, Biochemical Analysis of SH2 Domain-Mediated Protein Interactions. Z. Songyang and L.C. Cantley, SH2 Domain Specificity Determination Using Oriented Phosphopeptide Library. H. Okamura, C.T. Sigal, L. Alland, and M.D. Resh, Rapid High-Resolution Western Blotting. C.C. Franklin, V. Adler, and A.S. Kraft, Phosphorylation of Transcription Factors. J. Mirkovitch, Mapping DNA-Protein Interactions in Cells and Nuclei: Genomic Sequencing by Template Purification. T. Wada, H. Watanabe, H. Kawaguchi, and H. Handa, DNA Affinity Chromatography. T.K. Blackwell, Selection of Protein Binding Sites from Random Nucleic Acid Sequences. L.D. Kerr, Electrophoretic Mobility Shift Assay. S. Miyamoto, K. Cauley, and I.M. Verma, Ultraviolet Cross-Linking of DNA-Binding Proteins. Author Index. Subject Index. 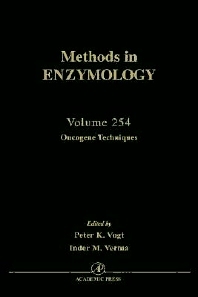 General Description of the Volume: Oncogenes have become a central focus of cancer research. All involved in this discipline will find this volume an invaluable aid in developing protocols needed for their research. Biochemists, oncologists, geneticists, molecular biologists, microbiologists, biomedical researchers, and cell biologists. The Salk Institute, San Diego, California, U.S.A.